He was born on April 22, 1830 in Bethel, Oxford County, Maine. William B. Lapham, History of Bethel: formerly Sudbury, Canada, Oxford County, Maine, 1768-1890; with a brief sketch of Hanover and family statistics, , at https://books.google.com/books?id=4vUgAQAAMAAJ . Augusta, Me. : Press of the Maine Farmer, (1891) , p. 587. William B. Lapham, History of Bethel: formerly Sudbury, Canada, Oxford County, Maine, 1768-1890; with a brief sketch of Hanover and family statistics, , at https://books.google.com/books?id=4vUgAQAAMAAJ . Augusta, Me. : Press of the Maine Farmer, (1891) , p. 588. Capt. Hugh Mason Genealogy, at http://kinnexions.com/kinnexions/mason/rr_toc.htm, #874. Watertown Records, Comprising the first and second books of town proceedings..., Watertown, Mass. : Fred G. Barker, (1890) , Vol. 3, p. 153. "United States Census, 1920," database with images, FamilySearch (https://familysearch.org/ark:/61903/1:1:MX1S-5KK : accessed 14 December 2016), Franklin L Mason, Malden Ward 1, Middlesex, Massachusetts, United States; citing enumeration district (ED) ED 257, sheet 9B, line 95, family 218, NARA microfilm publication T625 (Washington D.C.: National Archives and Records Administration, 1992), roll 713; FHL microfilm 1,820,713. 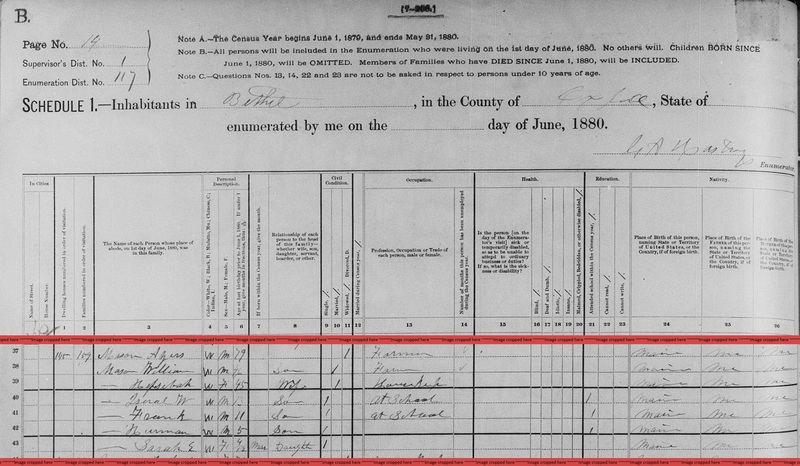 "United States Census, 1900," database with images, FamilySearch (https://familysearch.org/ark:/61903/1:1:M9T4-2J8 : accessed 14 December 2016), Franklin L Mason, Malden Ward 1, Middlesex, Massachusetts, United States; citing enumeration district (ED) 832, sheet 15B, family 244, NARA microfilm publication T623 (Washington, D.C.: National Archives and Records Administration, 1972. ); FHL microfilm 1,240,662. New Hampshire families in 1790, Vol. 1, , at https://books.google.com/books?id=83EjAQAAMAAJ . New Hampshire Society of Genealogists, (2007) , p. 104. Georgia Drew Merrill, History of Carroll County, New Hampshire, , at https://books.google.com/books?id=nQE2AQAAMAAJ . Boston, Mass. : W. A. Fergusson & Company, (1889) , p. 767. Thomas W. Baldwin, Vital Records of Cambridge, Massachusetts, to the year 1850, Boston: Wright & Potter Print. Co., (1914) , Vol. 1, p. 470. Sarah married. It seems likely that she would remarry after her husband's death in 1690, as some children were very young, but I can find no second marriage. James Savage, A Genealogical Dictionary or The first Settlers of New England showing Three Generations or Those who came Before May, 1692 on the Basis of Farmer's Register, (1862) , vol. 2, p. 226. Watertown Records, Comprising the first and second books of town proceedings..., Watertown, Mass. : Fred G. Barker, (1890) , p. 15. Watertown Records, Comprising the first and second books of town proceedings..., Watertown, Mass. : Fred G. Barker, (1890) , p. 30. Budd L. Duncan, The ancestry of Edward Myrock Wilder (1850-1924), , at https://books.google.com/books?id=m4dbAAAAMAAJ . Genealogy Pub. Service, (1995) , p. 59. Watertown Records, Comprising the first and second books of town proceedings..., Watertown, Mass. : Fred G. Barker, (1890) , Vol. 3, p. 150. 1880 United States. Census Office. 10th census, 1880 federal population census, Washington, District of Columbia: National Archives and Records Service, ([19--]) , FHL Film 1254484; National Archives Film T9-0484; Page 28B. Capt. Hugh Mason Genealogy, at http://kinnexions.com/kinnexions/mason/rr_toc.htm, #1463. 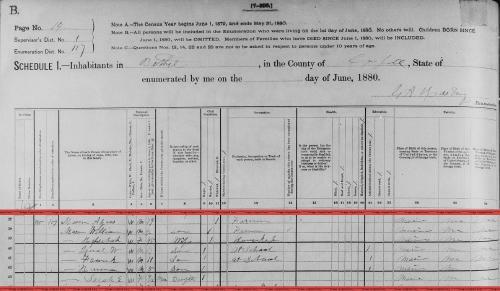 "United States Census, 1900," database with images, FamilySearch (https://familysearch.org/ark:/61903/1:1:MML5-CBD : accessed 9 April 2016), Hepzibah E Mason, Bethel town Bethel village, Oxford, Maine, United States; citing sheet 18A, family 437, NARA microfilm publication T623 (Washington, D.C.: National Archives and Records Administration, n.d.); FHL microfilm 1,240,596. "United States Census, 1850," database with images, FamilySearch (https://familysearch.org/ark:/61903/1:1:MDZ6-55Q : 9 November 2014), Semeon Mason, Madison county, Madison, Missouri, United States; citing family 651, NARA microfilm publication M432 (Washington, D.C.: National Archives and Records Administration, n.d.). Massachusetts Vital Records, 1841-1910, , Vol: 200 ; Page: 126. 1880 United States. Census Office. 10th census, 1880 federal population census, Washington, District of Columbia: National Archives and Records Service, ([19--]) , Census Place: Cambridge, Middlesex, Massachusetts; Roll: 543; Family History Film: 1254543; Page: 362C; Enumeration District: 433; Image: 0367. 1920 United States. Bureau of the Census. 14th census, 1920 population census schedules, Washington, District of Columbia: The National Archives, ([193-?]) , Census Place: Somerville Ward 7, Middlesex, Massachusetts; Roll: T625_718; Page: 3B; Enumeration District: 453; Image: 340. Massachusetts Vital Records, 1841-1910, , p. 105, no. 264.